The American fast food chain, McDonald’s, sells 2.365 billion burgers per year. The menu is profitable, but can anyone waiting at the drive through name ten items on the menu other than the ones on his or her order? The food is cheap, and it can be prepared quickly, but is it memorable? The answer is subjective, because it is a matter of individual taste. To be fair, though, when Maurice and Richard McDonald started the first McDonald’s restaurant in 1948, they were only aspiring to assemble—not make, because the food was cooked prior to its ordering—meals quickly. That desire was what first attracted salesman, Ray Kroc. He could not imagine a business plan that would require the eight malt and shake mixers that the brothers were asking to order from him. In 1955, he offered to open the first McDonald’s restaurant in Des Plains, Iowa. In 1961, he bought out the McDonald brothers. Kroc saw the business’ potential more clearly than the McDonald brothers did. Though he did not change the its name, the restaurant in its contemporary form is actually Kroc’s vision. He knew McDonald’s innovation was not its food, however fast. It was the investment Kroc originally offered the McDonalds: franchising and marketing of the McDonald’s organization. Kroc’s marketing made McDonald’s logo and its commercials ubiquitous. However, applicants native to countries other than the United States are not simply coveting the symbology of a company now permanently associated with the professional success a businessperson can achieve while operating under the tenets of a capitalist socioeconomic system. As a reliable franchise, McDonald’s promises considerable economic benefits for an owner. Franchises offer benefits for ambitious but inexperienced small business owners that other models for small businesses do not. A franchise provides every business owner with an effective business methodology, as well as business planning and marketing assistance. In addition, the stigmas American franchise owners face during periods of unfavorable press coverage, such as the public protest over McDonald’s deliberate marketing to children and its unhealthy menu choices, do not necessarily unfavorably affect franchise owners operating outside of The United States. Unfortunately for some aspiring entrepreneurs, the McDonald’s Corporation, which provides resources for people who are awarded franchises, will not award any to applicants living in countries under sanctions or trade embargos. Note: A McDonald’s that is currently in Cuba was built during the U.S. embargo, but it was not built on Cuban soil. It is on the U.S. army base in Guantanamo Bay. Entrepreneurs who are not permitted to open a McDonald’s franchise in their home countries sometimes develop creative marketing techniques in order to capitalize on the sociocultural significance of the famous chain without directly naming it. Suleiman Qassab, a resident of Kurdistan, fought with the Kurdish resistance movement in the 1970s. When the Kurdish resistance movement failed, he fled to Austria. While living there, he worked as a cook at McDonald’s. By the 1990s, he was living in Iraq again—the area that is now the country of Kurdistan belonged to Iraq until 2005—and he applied for permission to start the first McDonald’s franchise in his home country. He was an impressively qualified applicant, due to his previous experience as a cook for the restaurant chain. His application was denied, but the reason provided was unrelated to Qassab’s employment record. At the time Qassab submitted his application, the United States government was enforcing sanctions against Iraq, which then President George H. W. Bush declared against Saddam Hussein’s Iraq during The Persian Gulf War. Note: As of 2018, the U.S. is still enforcing sanctions against both Iraq and Iran. The United States requires Iraq to adhere to the conditions of its sanctions against Iran, although the Iraqi government is now permitted to import electricity from the Iranian government. As of 2019, the United Nation has repealed nine of its own sanctions against Iraq. Since no one at the McDonald’s Corporation would support his professional aspirations during The Persian Gulf War, Qassab opened, MaDonal. The missing letters in the restaurant’s name may be a reminder that Qassab is not illegally operating a McDonald’s, but it is nearly the only one. The building is red. A golden M is painted on the front, with the word, MaDonal, written below it in a familiar white font. 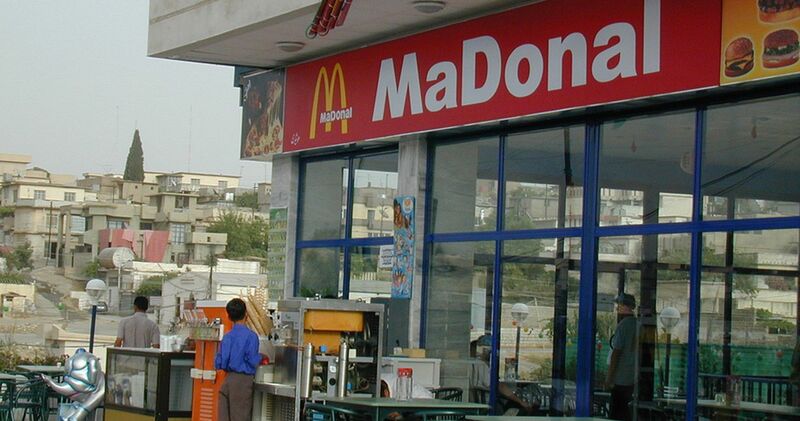 The restaurant serves Big Macs and fries, although the menus are written in Arabic. Despite MaDonal’s similarity to the chain that is obviously its inspiration, Quassab is not committing copyright infringement. He offers fast food that would be available at most fast food restaurants, hamburgers and fries. His building design and logo are similar to the ones McDonald’s uses, but they are not exact replicas. Qassab is not claiming to own a McDonald’s, and he is not requesting any of the resources from the McDonald’s corporation to which a franchise owner would be entitled. Qassab has made a successful business investment, be he still hopes he will one day be able to add a D to the restaurant name that is on his sign. That day may come sooner than Qassab could have imagined when he was requesting to start a franchise in Iraq. Now independent, Kurdistan is not presently subject to any U.S. sanctions. Even without attempting a marketing campaign, McDonald’s is very popular in the Persian Gulf region. There are two separate Facebook pages where participants advocate for the building of a local McDonald’s. One is for Iraq, and one is for Kurdistan.